Are you financially compatible with your partner? This is a question that everyone needs to address before marriage. Even if you aren’t planning on marriage, it’s still a good idea to consider your financial compatibility before you get too involved with someone. The results of the quiz can be eye-opening for many couples. I was actually pleasantly surprised. My husband and I have different financial priorities, but, according to this quiz, we’re doing ok in terms of financial compatibility. My husband doesn’t particularly enjoy talking about money, but we do occasionally touch base on where things are going. We have shared financial goals, and we trust each other with money. 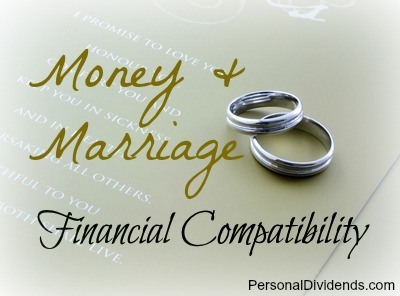 Our financial compatibility was better than I expected, despite not having any sort of money discussion before we were married. Since my husband and I do have different money personalities, there are challenges that we need to overcome. Luckily, we’ve overcome many of these issues and we have worked out a spending plan that works for us. One of the things we had to learn to do was to focus on the similarities. The quiz at Go Banking Rates put a lot of emphasis on shared goals and decision-making. This has been key in my own marriage when it comes to money. While we don’t always have the same priorities when it comes to short-term spending, we both have the same goals when it comes to retirement, building an emergency fund, and helping our son get a good education. It’s these shared goals, and the fact that we are both working toward them, that makes a big difference in our marriage, and makes us financially compatible — even though at first glance we appear almost complete opposites. In the past, my husband didn’t want anything to do with talking about finances. However, that’s changed over the years. He still doesn’t care that much about it, but he’s willing to have discussions about what to do next, and how to proceed. I think talking about your money, and touching base on occasion (for us it’s maybe twice a year) is a good thing. You both need to know where you stand, and you need a solid idea of what to expect. You also need shared goals so that you are able to plan ahead. If you don’t have anything that you are working on together, I think that’s a red flag for real financial issues as a couple. What do you think? Are you financially compatible with your partner?